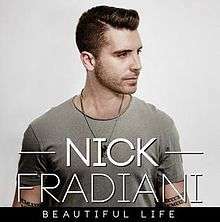 Beautiful Life is the coronation song from the winner of the fourteenth season of American Idol, Nick Fradiani. The song was written by Chris Carrabba, Rykeyz, Ayanna Elese. The song was written by Chris Carrabba of the rock band Dashboard Confessional together with his friends Rykeyz and Ayanna Elese. According to Carrabba, the song was written in "a little bit of a vacuum," and how it came to be submitted to Idol was "still a blur" to him. It was given to Fradiani as his coronation song. Fradiani first heard the song the day after making Idol's top three and recognized Chris Carrabba's voice who he said he was a fan of since high school. Fradiani described the single as "fun. meets the Goo Goo Dolls meets me" and he was happy how it came out. Scott Borchetta, the mentor on the show, thought that the song won Fradiani the competition. The song was released for sale after Fradiani performed the song in the final two performance night on May 12, 2015. The song debuted on the Billboard Hot 100 at No. 93, selling 50,000 copies in its first week. The song also debuted on the US Digital Songs chart at No. 22, and the Hot Canadian Digital Song chart at No. 48. The official music video was released on July 23, 2015. Directed by Shane Drake, the video was shot in Nashville in a single night. "In the video, Fradiani hangs out with friends on what is his last evening before setting out to make his musical dreams come true. The group sneaks past a fence and hangs out in an abandoned building, gets pizza at a local parlor, and caps off the night with beers before saying heartfelt goodbyes." The song has been chosen as the official theme song for Fox Sports coverage of the seventh FIFA Women's World Cup starting in June 7, 2015. The video for the single features the US soccer team. 1 2 Michele Amabile Angermiller (May 14, 2015). "'American Idol': How Dashboard Confessional's Chris Carrabba Came to Write Nick Fradiani's Coronation Song". Billboard. ↑ Brian Mansfield, USA TODAY (May 14, 2015). "After 'Idol,' Nick Fradiani's ready to work". USA Today. ↑ Nicole Pajer (May 14, 2015). "'American Idol': Scott Borchetta Talks Nick Fradiani Plans, Season 15 Return". Billboard. ↑ "Nick Fradiani's "Beautiful Life" Surges Into Top 5 on iTunes". Headline Planet. May 13, 2015. ↑ Gary Trust (May 22, 2015). "Hot 100 Chart Moves: Fifth Harmony Scores First Top 20 Hit". Billboard. ↑ Ashton Edwards (May 14, 2015). "American Idol winner Fradiani to sing official song for FIFA Women's World Cup". Fox 13. Archived from the original on 2015-05-31. ↑ Patrick Gomez (May 13, 2015). "Nick Fradiani Wins American Idol – and Releases His First Music Video!". People. ↑ "Nick Fradiani - Album & Song Chart History". Billboard. Retrieved July 1, 2015. ↑ "Nick Fradiani – Chart history" Billboard Hot 100 for Nick Fradiani. Retrieved December 26, 2015. ↑ "Nick Fradiani – Chart history" Billboard Adult Pop Songs for Nick Fradiani. Retrieved October 22, 2015. ↑ "Nick Fradiani – Chart history" Billboard Pop Songs for Nick Fradiani. Retrieved July 1, 2015.